In 2008/2009 Roger Palmer travelled to the three southern hemisphere continents over which the Tropic of Capricorn passes - Australia, southern Africa and South America - with the intention of developing a project that would link these places through a consistent approach to making photographs. On each continent, Palmer arrived at an airport close to the tropic - Rockhampton, Queensland / Windhoek, Namibia / Guarulhos, São Paolo - and travelled by rented car for twelve days, crossing the Tropic of Capricorn on at least one occasion, before returning to the same airport at the end of each journey. The journeys were timed to coincide with the spring and autumn equinox (Australia/Brazil) and the summer solstice (Namibia). 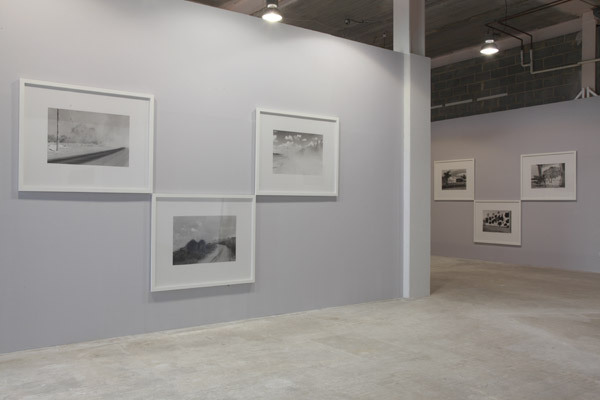 The resulting exhibition comprises a group of gelatine silver prints of uniform dimensions. Palmer's photographs focus on quotidian observations of cultural, climatic and topographic details found in the public domain. They suggest different layers of time: the temporal evidence of geographical change; the gradual changes of social time; and the surface disturbances of everyday events. Each hand-printed photograph presents a picture-plane that refers to its own two-dimensional condition: a monochrome representation of spaces, structures, found images and signage exposed by local daylight conditions. The arrangement of the pictures on two viewing levels, with the corners of their frames touching, might suggest that they are closely related and yet also discrete artefacts. For each triptych aspires to be both a group of related images and yet also a composition of individual pictures which are nevertheless components of a larger ensemble. The project's title, Latitude , proposes connections between different parts of the world through their position in a zone of climatic division around the Earth's circumference, the southern boundary between the climatically distinct Temperate and the Torrid Zones. The pictures are presented together for the first time here in Leeds, in the northern hemisphere. Latitude might therefore suggest an exploratory, open-ended approach to photography for both the artist and for visitors to the exhibition.